Nonfiction Picture Book Wednesday is hosted by Kid Lit Frenzy. Every Wednesday, I'll review non-fiction picture book. (It may not always be a picture book. Be sure to visit Kid Lit Frenzy and see what other non-fiction books are shared this week! GoodReads Summary: A masterful blend of artistic skill, scientific prowess, and impassioned theatrics lay at the core of Waterhouse Hawkins. A man of pure determination, he created the first life-size models of dinosaurs! This brilliant book is a fantastic nod to the genius of one man, and a glimpse into the beginning of an important era. As a boy in England, Benjamin Waterhouse Hawkins always wanted to be an artist. His passion led him to animals, and soon he was drawing and painting them with fervor. This eventually led to his true calling -- creating models of dinosaurs as they actually must have looked when they roamed the earth! With the help of scientist Richard Owen, he checked the fossil remains of dinosaurs against living animals and constructed a gigantic model. Among the first to witness his creation were Queen Victoria and Prince Albert, who reacted with pure amazement. In order to impress England's leading scientists with his work, Waterhouse Hawkins staged a lavish New Year's Eve dinner party and hosted the gala inside the body of his model! He also wanted the public to learn about the dinosaurs and their history, so he built smaller models, illustrated books, and lectured on the subject. His fame spread to the United States, and he was invited to New York, where he began to create model dinosaurs for a proposed Paleozoic Museum in Central Park. However, a corrupt politician put an end to the project, and vandals later broke into Waterhouse Hawkins's workshop and destroyed his models. Though distraught, he moved on to Princeton, where he built skeletons and created paintings about life on earth in the age of the dinosaurs. Eventually, Waterhouse Hawkins returned to England and continued his work, some of which can still be seen in Crystal Palace Park. What I Think: I've really been immersing myself into non-fiction biographies lately and I'm so glad I came across the story of Waterhouse Hawkins. Reading the author and illustrator notes at the end really helped me realize just how interesting his story is. Waterhouse seems like a super creative person but at the same time a person with will and determination to follow his creative ideas and dreams. I absolutely love learning about history that is new to me. I especially like being able to put all this new information into perspective. I know that we have learned so much about dinosaurs and that our understanding of their existence continues to grow and evolve...but I had no idea that the first fossils were uncovered in the early 1800's. In the whole scheme of the world, that's not really that long ago. Being able to read a book and help kids put things like this into perspective is so important. In today's world where technology abounds, I believe it's important to remind kids of history and how far we have come all thanks to human ingenuity and determination. One thing I really enjoyed about Waterhouse's story is that he goes through ups and downs along the way. Kids get to see hardships he endured and how he persevered in order to make his dreams come true. 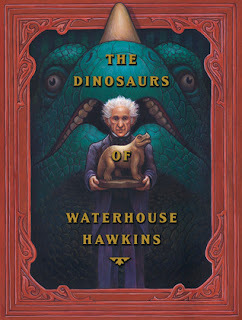 At the end of the book, they use illustrations to show how Waterhouse's creations look different from what we think the same dinosaurs look like today after more research. I believe in the growth mindset and Waterhouse's story shows students that even though Waterhouse may not have accurately captured dinosaurs, he did still try his best and his original creations led to further creations. Who knows how long it might have been before someone else had tried what Waterhouse did? He definitely paved the way for dinosaurs to be brought to life for people to experience. I love the potential to share this story with students and to be able to make connections to the growth mindset. "By the time he was a young man, he'd found his true passion: animals. He loved to draw and paint them. But what he really loved was sculpting models of them. Through his care and hard work, they seemed to come to life." Writing Prompts: Describe an animal you have seen before in real life and or in a book or on TV. Use your five sense to describe what the animal looks like.